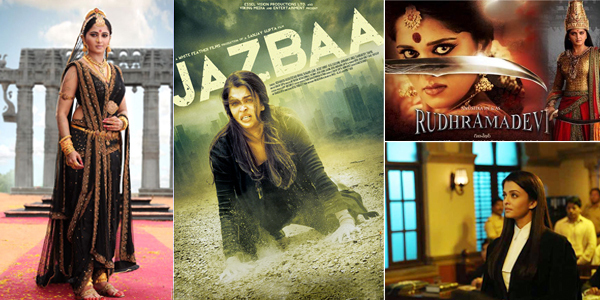 Raaga.com: Trade pundits predict Anushka Shetty’s RUDHRAMADEVI will have an edge over Aishwarya Rai Bachchan’s JAZBAA! Trade pundits predict Anushka Shetty’s RUDHRAMADEVI will have an edge over Aishwarya Rai Bachchan’s JAZBAA! For the first time after many years two women centric films viz. JAZBAA and RUDHRAMADEVI featuring Indian Cinema’s two most popular actresses Aishwarya Rai Bachchan’s and Anushka Shetty are set to clash with each other at the box office this Friday on October 9, 2015. While Aishwarya Rai Bachchan’s JAZBAA is eagerly awaited because it is her comeback film after five years on the other hand Anushka Shetty’s RUDHRAMADEVI is most awaited because it regarded as India's First Stereoscopic 3D historic film that has been into making for over two years hence there is huge curiosity among audience to watch. Though RUDHRAMADEVI is made in Telugu and Tamil but it has been dubbed in Kannada, Malayalam and Hindi thus in nutshell the movie has a pan India appeal and this is very reason why the movie is looked upon as a potential threat to Aishwarya Rai Bachchan’s JAZBAA! Speaking about JAZBAA, the film critics and film celebrities who have seen the film have given their thumps up for Aishwarya Rai Bachchan’s outstanding performance. Besides the movie is being applauded for its novel script where in a lawyer (played by Aishwarya Rai Bachchan) undergoes umpteen tribulation and ordeal to save her daughter kidnapped by the antagonist. What makes the script intriguing is that the kidnappers compel Aishwarya Rai Bachchan to defend the offender in the court in exchange of daughter’s liberty. Technically the movie is slick and is being termed as an edge of the seat thriller. On the other hand RUDHRAMADEVI too is much-admired for its rich production values and stunning VFX special effects which are regarded as at par with Hollywood standards. Readers would be surprised to know that BAAHUBALI director SS Rajamouli has seen the movie twice (Both in 3-D and 2-D) and was left perplexed by the film’s appealing visual effects. In fact SS Rajamouli has been so overwhelmed by the movie that after the Telangana government declared RUDHRAMADEVI tax free, SS Rajamouli has made an appeal to the Andhra Pradesh government to also make it tax free. We pray both the films do good business so that more and more filmmakers are encouraged to make women centric films in future.